Facebook has been a great platform to connect and share with family, friends and even strangers. It allows you to upload videos in almost all popular video formats like AVI, MP4, WMV, MOV, FLV, ASF, etc. to share with the world. However, when you are trying to upload DVD to Facebook, you may get into trouble since Facebook doesn't support DVD uploading. According to Facebook Help Center, H.264 video with AAC audio in MOV or MP4 format is preferred for uploading. To share DVD on Facebook, you will need to rip DVD movies to Facebook H.264 MP4 or MOV first. 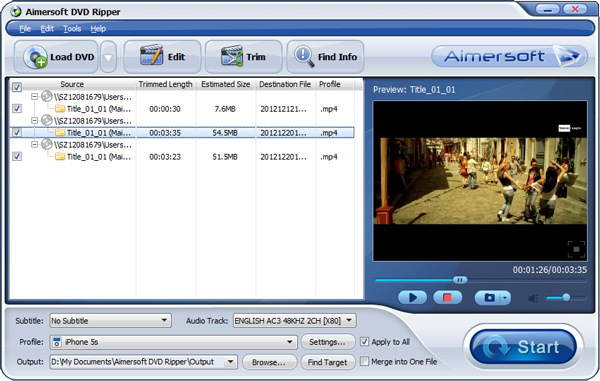 With the assisstance of Aimersoft DVD ripper for PC, all becomes easy. It can serve as a professional DVD to Facebook converter that lets you get videos with optimized settings for uploading to Facebook. Besides, it can also convert DVD to video formats like AVI, WMV, FLV, ASF, M4V, MKV, etc. and extract audio from DVD for playing and sharing anywhere with smart DVD video editing features. Free download it now and follow the below steps to convert DVD to Facebook with ease. If you are using a Mac, you can use the equivalent Aimersoft Mac OS X DVD ripper to help you upload DVD movies to Facebook on Mac (including Mountain Lion and Mavericks). Convert DVD to iTunes supported MOV, MP4, M4. Extract DVD background music to iTunes AAC, MP3. Automatically transfer converted videos to iTunes Library. Embed iTunes movie metadata for easy video management. After downloading DVD ripper, install and launch it. The software interface is as below. You can finish converting DVD movies to Facebook in three simple steps. Add the DVD files you want to rip to the program by clicking "Load DVD" and selecting DVD files. You can also add ISO and IFO files. 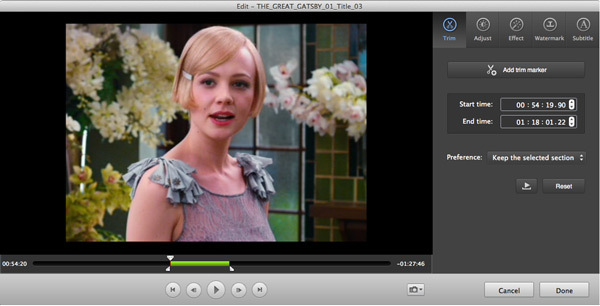 Added files can be previewed and you are free to take snapshots of the movie scenes. Select Facebook as the output format from the drop-down menu of "Profile". If want to adjust the video visual effects, simply click the Edit button. In the pop-up video editing window, you can adjust the video brightness, saturation, contrast, apply special effects, add watermarks, subtitles and more. Click "Start" to start ripping DVD movies to Facebook and wait for the conversion to be done. After the conversion, you can freely share the video files on your Facebook with more people. 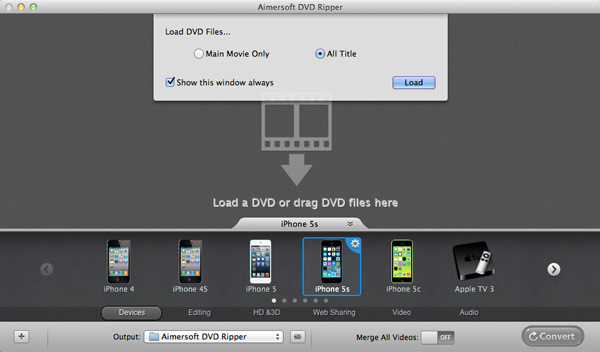 Download and install Aimersoft DVD Ripper for Mac. To begin the conversion from DVD to Facebook supported MOV or MP4 format, first you must insert the DVD disc into Mac DVD drive. And drag the DVD folder into the main window of the ripper. Before you start the ripping process, please designate an output format for the conversion. Since Aimersoft DVD Ripper for Mac offers ready presets for Facebook, so you can choose "Facebook" format from the "Web Sharing" output list. You can touch up the video as you like by clicking the Edit icon to open the video editor. Trimming, cropping, visual adjustment, watermarks and subtitle loading are all supported. When all settings are done, simply click the Convert button on the right bottom of the main window. And Aimersoft DVD to Facebook ripper will do all the rest for you. The conversion will be finished in a few minutes. Now, you can get the ripped DVD movies from the output folder and share on Facebook without any barriers. How to Rip/Convert DVD to AVI Videos?